He was educated at Wolverhampton Grammar School and read History at St John’s College, Cambridge, gaining a 1st Class degree. A solicitor by profession and a director of Christies, the art business, he was elected to parliament on 5th June 2014. 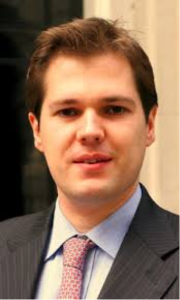 At the general election of 2010, he contested Newcastle-under-Lyme for the Conservative Party, adding 9.4 per cent to the party’s vote, but falling short of incumbent, Paul Farrelly of the Labour Party by 1,582 votes. At this year’s by-election he retained the seat for the Conservative Party with a majority of 7,403. Robert became the first Conservative candidate to win a by-election in Government since the election of William Hague in the Richmond by-election in 1989.